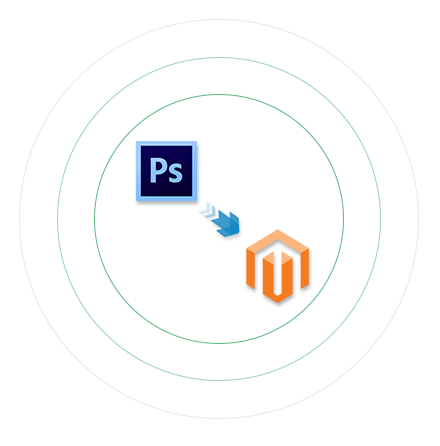 If you have a PSD file for your website coding, then you can easily transform it to a Magento template by our PSD to Magento conversion services. Assigning this task to a well-known ecommerce service provider, you can get this task done easily and thus take benefit of this powerful ecommerce platform. At Evince, we take utmost care of our client’s requirements and do the job accordingly. You can hire a PSD to Magento developer from us and get your PSD converted into Magento website. Alternatively, Magento offers a PSD to Magento theme conversion that can help you to convert your PSD into a fully functional Magento Store Template. PSD to Magento change is the most looked solution for business organizations to make an engaging site. PSD to Magento Development is generally perceived for taking on the web organizations to the following level by upgrading the site quality. This conversion offers clear visibility to the website, responsive view, SEO Friendly, cross browser compatible and pixel precise websites. We have programmers who are qualified and technically sound and they can offer you all PSD to Magento conversion services. They also offer PSD to HTML5 conversion services and they give you easy to remember codes as well. We offer you multilingual websites so that your business grows globally and multiple payment gateway options as well to make things easier both for you and your customers. It offers a user friendly ease and web compatibility. PSD to Magento conversion can influence your online store to look according to your wants with an extremely bother free process. Increases your ecommerce website speed. With its appealing look and features it can easily come up to the top ranks. Magento is compatible with almost all browsers and thus PSD to Magento allows for easy accessibility. Conversion from PSD to Magento ensure uniformity in layout, font and style. Capability of adapting to the new changes trending according to designs.